A well-functioning furnace should accomplish two important goals. First, it should provide uniform, consistent heat for every area of your home, and second, it should run efficiently and quietly. When your furnace is either working too hard because of a malfunction or not working at all, you need quality furnace repair from the most trusted name in HVAC services – Front Range HVAC. Many modern furnaces are technological marvels. They use advanced components to ensure optimal heating. As advanced as they are, all furnaces will eventually break down and require repair or replacement in time. Timing the replacement of a furnace can be tricky. On the one hand, you want to budget for the expense without causing too much disruption in your finances. On the other hand, you need to stay warm during Colorado’s colder months. The professionals at Front Range HVAC will work with you to form a strategy for the replacement of your furnace, working within a timeline and budget that is suited for your unique needs. Identify the mechanical footprint of the furnace, noting the BTU rating and energy consumption specifics. Determine the most comparable replacement by evaluating current models available from Carrier, the leader in furnace manufacturers. Work with you to arrive at a financing arrangement, if needed. Schedule a time to perform the removal of your old furnace and the replacement of the new furnace. 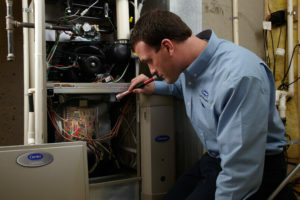 Conduct a thorough suite of tests to ensure that the new furnace is operating as it should. Follow-up with you post-installation to identify any areas where additional modifications may need to be made, including adjustment of air flow, inspection of belts and pulleys, and a final furnace check-up. Front Range HVAC knows how overwhelming it can be to have to deal with the removal and replacement of a defunct furnace. We make it easy by educating you on all of your options, working with you to make financing easy, and standing behind every furnace we install well after the sale has been made. We know that we’re not successful unless our customers are elated with their new furnace. It’s this dedication to excellence that has made Front Range HVAC the go-to furnace replacement specialists in Colorado. If your furnace needs replacing, don’t put it off any longer. To inquire about having the furnace in your Colorado home or business replaced, contact Front Range HVAC at (303) 942-1372, today. We look forward to hearing from you!